Are you a procrastinator? If you’re reading food blogs the night before Thanksgiving, good chances you are. Or perhaps, you do what I do, which is make a plan weeks in advance, only to start second guessing myself right before I start cooking, or even in the midst of cooking. Ugh, it’s a serious problem. I already plotted out the Roasted Butternut Squash with Pears and Cranberries, the Pumpkin Lasagna, and the Cloud Topped Pumpkin Loaf. Don’t forget some of last year’s favorites like Bacon, Beets, and Brussels Sprouts, and the Upside Down Cranberry Pumpkin Cake. 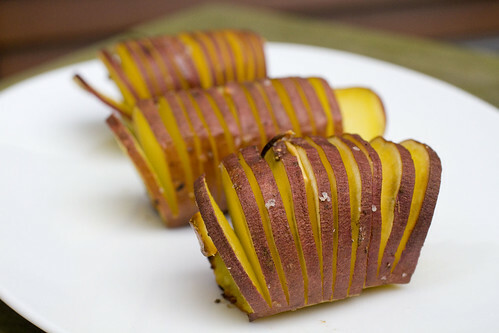 But after seeing so many wonderfully enticing pictures of Hasselback potatoes all-over the blogosphere (on Things We Make, Sea Salt with Food, Craving Comfort, and Almost Bourdian), I wanted those too.